The Premier Conference in the World for Travel Writers and Photographers! "Every summer some magic happens at Book Passage. For four days in August, some of the best travel writers, editors, photographers, publishers, and agents in the world convene in Corte Madera to share the art and heart of the work they love at the Book Passage Travel Writers & Photographers Conference." "I owe a huge karmic debt to Book Passage! Without Book Passage, I'd be sitting in my house twiddling my thumbs instead of preparing to introduce my fifth book!" "Coming to the Conference for the first time this year  I was struck not just by the talent and passion (which are the norm at writing workshops) but by the friendliness and lack of pretentiousness (which aren't). Everyone — students as well as faculty — seemed well-read, well-travelled, curious, engaged, open. If good Americans go to Paris when they die, good American travel writers go to Corte Madera." "Last night was about more than books to me. It was a about life, inspiration, a dream that began in 2006, when I attended my first event (the Travel Writers' and Photographers' Confence) at Book Passage, met Linda, and hoped, one day, that I would be able to write a book of my own. Thank you for the opportunity to celebrate this dream-come-true. You have given a great gift to me and my family during a very special time in our lives — something we will always remember." Read Anne's story -- winner of the 2018 Book Passage Travel Writing Award -- at the link below. Want to meet with a member of our faculty one-on-one? Optional 30-minute private consultations are available for $95. You may use that time to discuss a concept or proposal, or to have a faculty member review and provide feedback on your work. A list of faculty members available for consultations will also be made available prior to the conference. 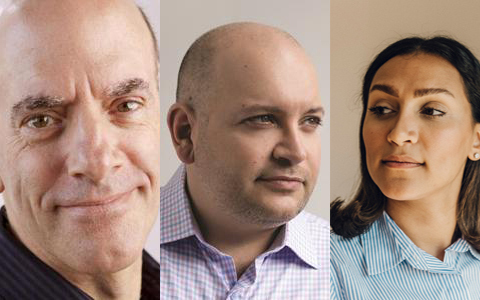 Get a sneak peek at our 2019 Faculty (with more to be announced)! The collegial atmosphere of this four-day conference is legendary, with participants and faculty from all over the world. There are morning specialty classes, afternoon sessions on topics of interest, and evening presentations by well-known writers and photographers. Thinking of traveling from afar to learn the craft of travel writing or photography? No problem! We have some great recommendations for places nearby where you can rest and relax. These optional workshops are taught by Don George, Robert Holmes, and Candace Rose Rardon on the Wednesday prior to the conference. They are open to the public and available to conference participants for a reduced fee. Join acclaimed National Geographic Traveler and BBC Travel writer and editor Don George for a day of exploration and travel writing in San Francisco. The group meets at the store at 9:00am and takes the ferry to the historic Ferry Building, while discussing how to find, research, and write travel stories. They continue to S.F.’s lively North Beach, where after a short tour they are let loose to find their own stories before meeting for lunch to discuss what they found. Participants will write a short piece based on the day’s discoveries. Lunch and round-trip ferry ticket included. Join award-winning landscape, food, and wine photographer Robert Holmes for a day of exploration and travel photography in San Francisco. The group meets at the store at 9:00 am for a discussion of travel photography, and then to take the ferry to San Francisco to photograph and document one of the city’s most colorful and historic neighborhoods in North Beach. The group returns to Book Passage to review their day’s work. Digital cameras are recommended so that participants can get instant feedback at the end of the day. Lunch and round-trip ferry ticket included. Travel sketching not only helps us create rich, vibrant memories of the places we’re exploring — it’s a powerful, meaningful way to unlock deeper connections when we’re traveling. Join professional sketch artist and illustrator Candace Rose Rardon for a day of watercolor travel sketching. Whether you’re looking to hone and develop your sketching skills, or discover them for the first time, creativity will be at the heart of this workshop. The morning will begin at Book Passage in Corte Madera with a classroom-based sketching workshop and series of demonstrations covering perspective, composition, and watercolors. After lunch, Rardon will lead participants on the Larkspur Path to downtown Larkspur, where the group will sketch on-location together. By the end of the day, participants will have developed greater confidence with sketching on-location, as well as a creative new way of documenting their travels. Lunch will be provided. 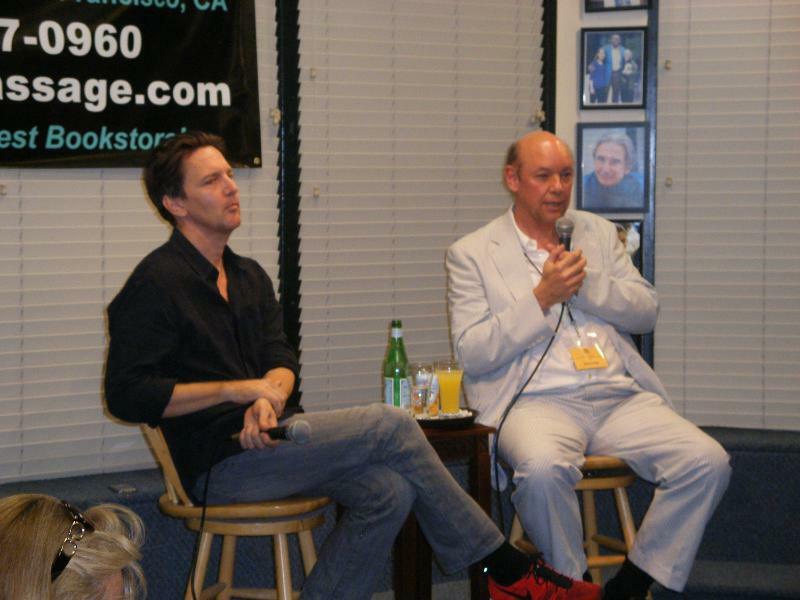 Author-actor-director Andrew McCarthy and conference chair Don George in discussion at the 2012 Travel Writers & Photographers Conference.